The AmD with AutoAid/RCIB Insurance Racing team will seek to maintain its strong start to the Dunlop MSA British Touring Car Championship season when the series heads for Thruxton this weekend for the third round of the year. 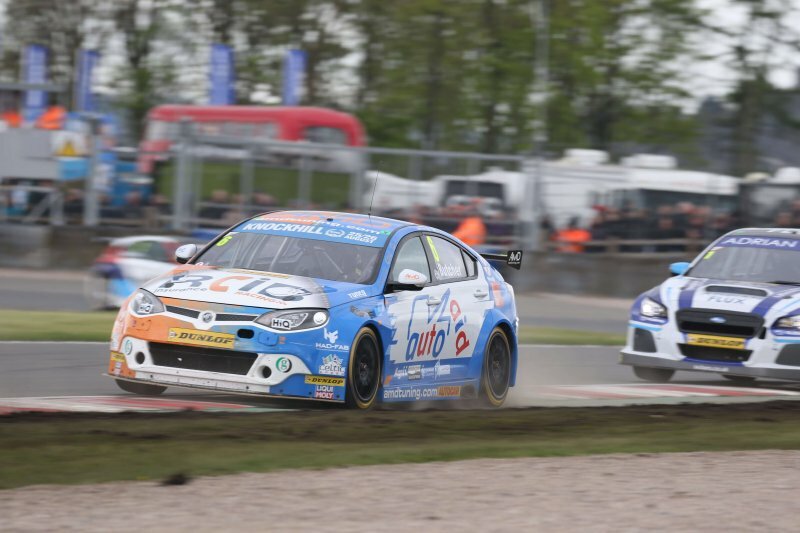 The West Thurrock-based team picked up a pair of points scoring finishes last time out at Donington Park to make it six for the season so far with the MG6 GT, which it is campaigning for the first time this year. Fife racer Rory Butcher continued his impressive start to life with the MG in the second meeting of the year, with two top 15 finishes leaving him just a point away from the top ten in the championship standings. The 31-year-old will be making his return to Thruxton for the first time since 2013, when he posted the fastest lap of the opening race whilst competing in the Porsche Carrera Cup GB. Rory has fond memories of the quickest circuit on the calendar having also qualified on the front row in the 2012 Carrera Cup – a meeting where he also secured his first two podium finishes in the series and led a race for the first time. With three top ten finishes to his name already this season, Rory will seek to add to his tally this weekend to maintain his strong placing in both the Independents’ and Jack Sears Trophy standings. Team-mate Tom Boardman endured a frustrating weekend at Donington Park when his hopes of a strong points finish in the final race were ended by contact that forced him to retire for the first time this season. Returning to the series this season for the first time since 2011, the Forton-based driver has already shown his pace having come close to a podium finish at Brands Hatch and sits just outside the top ten in the Independents’ championship. The 34-year-old has a strong record at Thruxton in the past, having scored a fine fifth place finish on his debut in the top class of the series back in 2010 and his maiden podium finish twelve months later. Keen to put Donington behind him, Tom heads for Thruxton in confident mood and optimistic about his chances of returning to the points scoring positions. “I’m really looking forward to Thruxton this weekend. It’s the quickest circuit on the calendar and one of the most exiting, and it will be good to return after five years away. “The fact that we ran the hard tyre that is mandatory at Thruxton during the Donington weekend means we have an idea of how it will perform on the MG and have some good data to take with us into the weekend. That will also help us when you bear in mind that we didn’t take part in the test that was held last month, although I’m confident that that won’t hold us back and we’ll soon be up to speed. “Thruxton is a weekend I’ve been really looking forward to as I have always enjoyed the high-speed nature of the circuit. It’s also a circuit where I’ve gone well before, and I have great memories of taking my first outright podium in the SEAT back in 2011. “Donington proved to be tough for me as we missed out on a really good result in the final race when I was punted off into the gravel, but there were still plenty of positives to take away from the weekend. “With two rounds down, I think we’ve made a good start to life with the MGs and both Tom and Rory have shown strong pace on track. We’ve been able to get some good points on the board and the aim this weekend is to try and add to our tally and maintain our position in the championship. “Although it’s been a few years since either driver raced at Thruxton, they both have good records at the circuit in the past and we are hopeful of more solid results this time around. “We’ve shown that the MG is strong in race trim and whilst points in all three races are the aim, it would be great to see both cars pushing towards the top ten – it’s certainly something we feel is achievable.